Taking the dive into creating custom software for your business is not a small decision. Whether it’s creating a new app or adding features to an existing one, you could be looking at $10K, $100K or even $1M dollars in costs. There’s no reason to ever make that decision unless you will get at least that much in return. Justifying your return is usually some simple math – what are my costs for developing, implementing, and supporting the new app vs. what will I either SAVE or MAKE from owning it? 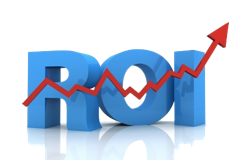 You can get fancy with calculating the ROI over time, create spreadsheets with pro-forma sales and expenses, and while those are worthwhile analyses and we do them all the time, at the end of the day, it should be obvious that the software will deliver a return. Sometimes the return is pure cost savings (e.g. it takes 4 employees to manage this process vs. $50,000 dollars of software that can be run by one person working part-time) and other times, it’s purely new revenue (e.g. my customers will pay me $50,000 dollars more over the next year if I build this $10,000 dollar feature). If your 4 employees don’t need to be entering data all day, those FTEs could instead be prospecting for new customers. A new feature that makes it much easier for your customers to use the software can decrease customer turnover. The math really isn’t complicated, and obviously, when you have both cost savings AND increased revenue, it makes it easier to justify the investment. We know we’re successful when our customers are successful and sometimes saying “No” is the right thing to do. We also know it helps our customers trust us, so that when we say, “Yes, let’s do this,” you can trust that Woodridge’s development and business experience is with you.